So what if this is the second cheesecake I have made in 2 weeks. Maybe I like cheesecake, don’t you??? I was actually craving strawberry cheesecake last week when I made the “Peanut Butter Cheesecake“, but I was so busy figuring that one out, I kind of forgot about it until today. I looked up low carb strawberry cheesecake on Pinterest and tried one of the recipes. I am not going to beat around the strawberry vine, I am just going to say it. IT WAS HORRIBLE. It had way too much egg and it just wasn’t what I envisioned. So, I started over and did it my way. 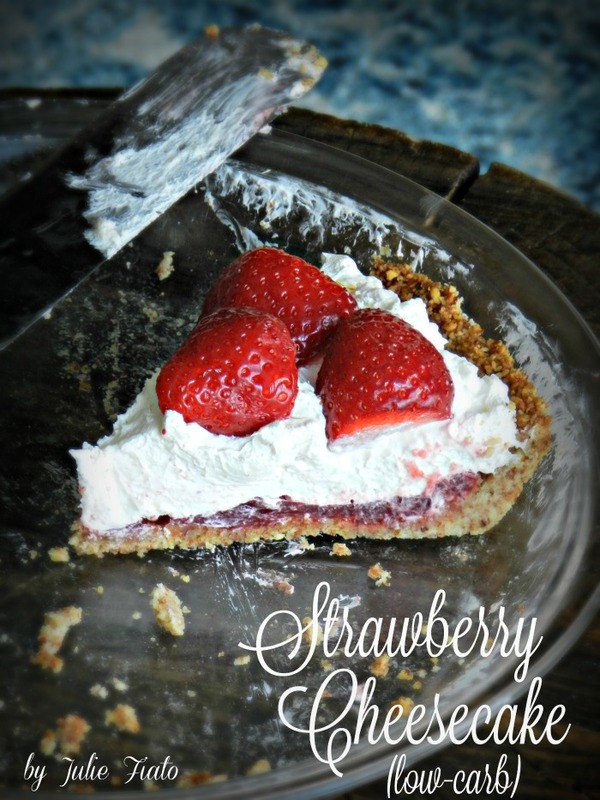 This “Low-Carb Strawberry Cheesecake” reminds me of that strawberry pretzel jello dessert that everyone makes at the Fourth of July. It has similar qualities because I added salt to my crust (feel free to leave salt out of crust if you need to). You can also substitute the strawberries & preserves with your favorite. 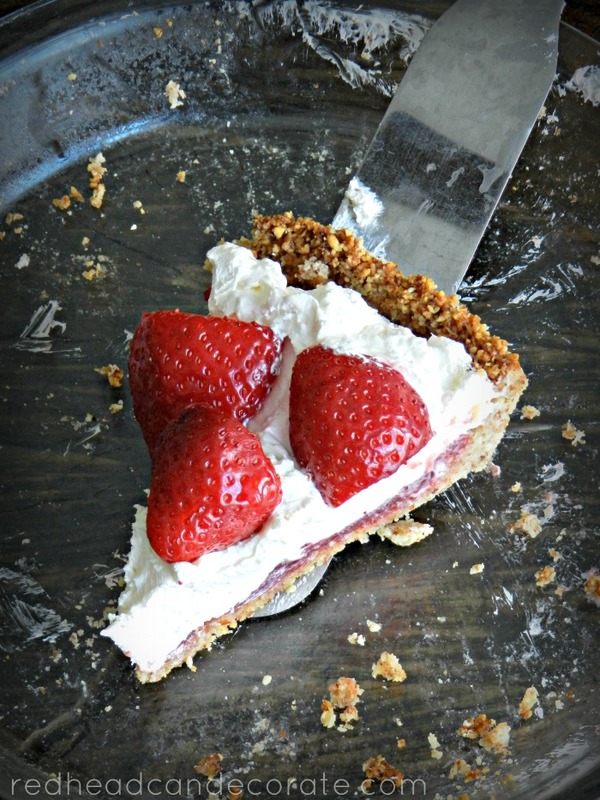 Introducing my very own recipe for “Low-Carb Strawberry Cheesecake”… I hope you love it as much I do! It’s perfect for Valentine’s Day, or any day. *Remember a little almond flour consists of many almonds, so do not eat too much pie at once. Preheat oven to 375 degrees. Mix first 4 ingredients in pie plate and spread out with fork going up the sides a little is always a good thing. Bake 15 minutes, and then cool completely. Spread preserves onto cooled crust and set aside. In a mixer, mix cream cheese until smooth. Fold in Cool Whip. and mix gently until well blended. Don't mix too long or the fluff will deflate. Top with cut strawberries any way you prefer. Chill for 30 minutes, then EAT! This cheesecake rocks. I know first hand! Delish! Just give me a small piece, Love, Dad in NY.